Adding sound insulation to your Mirage? I'm wondering how many people have thought about doing this? Its not an uncommon complaint that road noise and wind noise are louder in the Mirage than other vehicles. However, its also quite easy to add additional sound deadening to the interior, and even to the exterior. Has anyone identified where the majority of the noise comes from? The wheel wells? The A-pillars? I've heard of people using spray on rubberized undercoating (like this example on AMAZO N) in their wheel wells with good results. This reduces tire and road noise a bit. A spray can only costs a little bit of money. All you do is remove the tire, cover up the brake stuff, clean the wheel well and spray it on. Very easy. It would also be really great if someone could pull back their carpet to see where the OEM sound deadening is placed. However, I don't see anyone doing this unless they are going to add sound deadening material. Adding additional dynamat or similar product (there are many) in key areas could really help out. Hi! I add sound deadening material on my car, on the whole floor from back to front, inside the doors all 5, and round the wells house. That is great. But, I only found this one picture, and it looks like the trunk. Did you have any pictures of the cabin area and what you did? We'd love to see them. Also, what product did you use? its a 3mm Adhesive tar mat, and I put it on the whole car inside, from the trunk all the way up to the bulkhead in front. sorry I have no picture, but I take out every thing inside the car, the seats, the carpets everything, and put it on the floor. 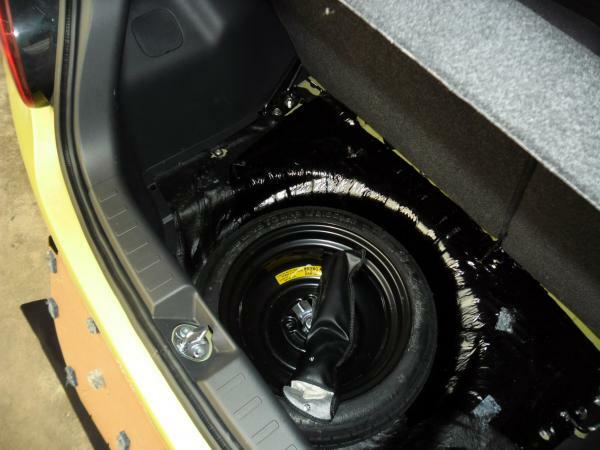 and back in the trunk, inside the side-plastic, around the wheel arches, and inside all doors. Haha, thats great, thanks for sharing. Anyone else done any sound insulation? Do you work this by yourself? Do you have any reference about the good sound insulator? The brand ? And what is the cost? I think in INA, i have to pay for around USD 100-150 for sound insulation. Instead of putting tar mats down, couldn't you just spray rubber in under the carpets?